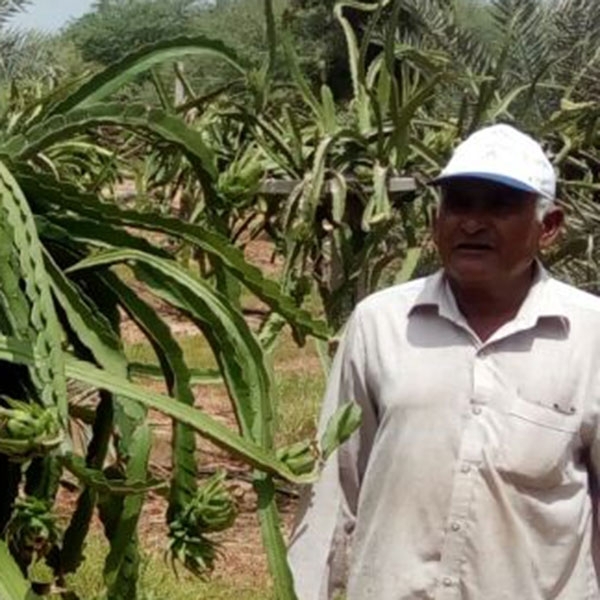 Naran Halai, a progressive farmer, has a small land holding in the Bhuj Region of Gujarat. He has tried to maximize the production of his farm by trying the cultivation of new and different fruits. Today, his farm has 3 major fruits- Dates, Dragonfruit and Honey Dew Pomelo. His modern outlook towards farming has allowed him to maximize his output and sets him apart from the traditional farmers of the region. Dragon fruit is native to Southern Mexico and Central America but grows all over the world today. The two most common varities have a bright, red skin with green scales that resemble a dragon — hence the name. The variety that is most widely available has white pulp with black seeds. Its taste can best be described as slightly sweet and sour, a cross between a kiwi and a pear.